Guangzhou Yuansheng ceramic jade craft Street, commonly known as "Antique Street", Guangzhou is not only one of the top ten professional market, and is the largest ceramic jade crafts southern distribution market. 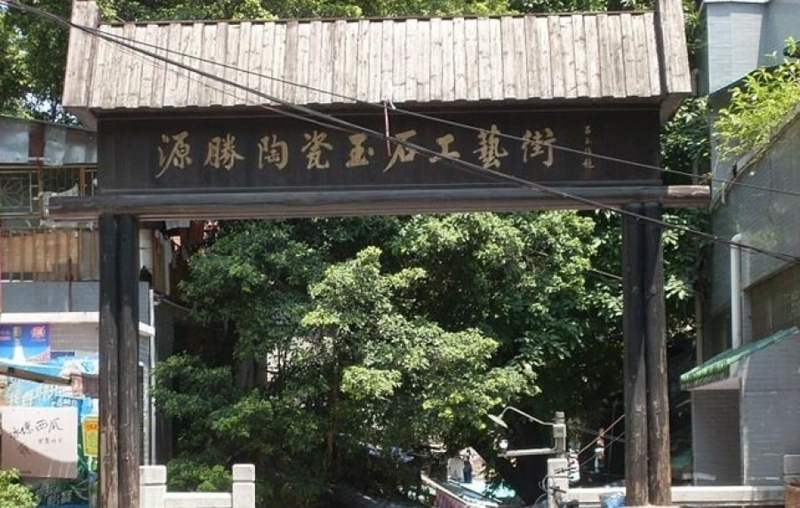 "Antique Street" is located in Guangzhou between Kang Road and Wenchang Road, adjacent to the next nine Road Pedestrian Street, the former Jade Street and Hualin Si echoes. Total length of nearly 1000 meters, a total of nearly one thousand business ceramic jade crafts shops, as most old Liwan District of Guangzhou Xiguan style unique tourist attraction. Streets, countless variety of fine, Ran Grand, a Chinese folk around gathering place for arts and crafts. Shiwan ceramic and Jiangxi Jingdezhen, Yixing tea, Fujian Shoushan stone and Soapstone, Myanmar jade and bamboo, wood carving, root carving, bronze, ivory, etc., are numerous, and splendor. Streets, shops and old houses decor Guangzhou Xiguan follow the ancient tradition of residential areas, attracting fans of different needs, gold-diggers, collectors and tourists, in this linger.